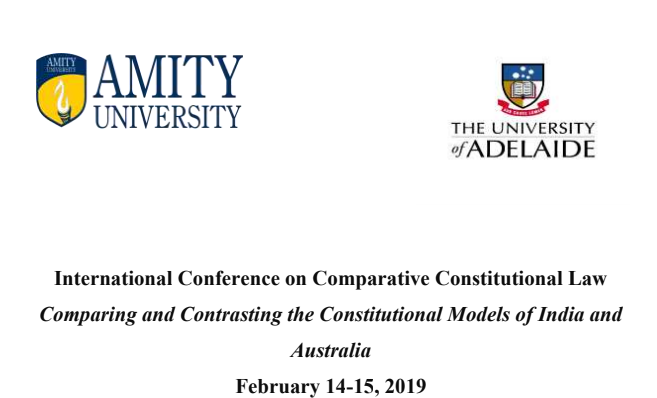 Amity Law School, Noida, in partnership with Adelaide Law School is hosting an international conference on Comparing and Contrasting the Constitutional Models of India and Australia. The conference is being organized in academic collaboration with National Academy of Legal Studies and Research (NALSAR), Hyderabad; National Law University, Jodhpur; Dr. Ram Manohar Lohiya National Law University, Lucknow; South Asian University, New Delhi, and Indian Institute of Public Administration, New Delhi. Queries can be addressed to Romsha Panwar  and Manas Agarwal .